Discussion in 'Contrails and Chemtrails' started by MikeC, Apr 20, 2011. "@marketsdata You are right. There is a lot of misinformation out there these days. And this video is a fine example. He finds one photo (in long perspective) and claims the planes should be banked in the apparent tight turn. No. Sorry. I don't buy it. TE is going to have to do A LOT better than this." but I am blocked by the owner of the video. Tankerenemy has issues. I called him on his "unmarked 747 'Chemtrail' plane" and was promptly blocked. TankerEnemy unfortunately seems totally unable to back down, even when it's totally obvious he's made a mistake. He claims that my old weather books are fake, and that contrails can't possibly persists, so ANY evidence of persistent contrails is faked. I suspect that the other chemtrailers think he's some kind of double-disinfo agent. 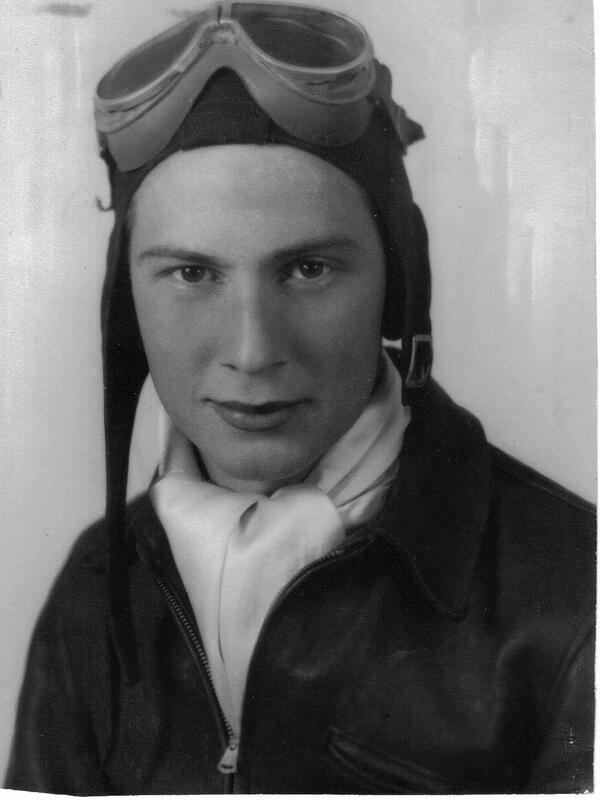 My life has included a lot of exposure to aircraft, because my father flew from 1943 training in biplanes through WWII in the B-24 Liberator, seaplanes in the late 1940's and up to 1971 including Bell helicopters. He loved flying so much that cheap entertainment for him was taking our family down to Love Field on hot summer evenings in Dallas to watch the 707's roar at takeoff. He flew through my childhood on weekends with the National Guard, and I remember wearing his helmet pretending to be a 'spaceman'. I never thought about the contrails at all, but have an early distinct memory of hearing and seeing a flight high flying B-36's out of Ft. Worth. These were the largest piston engine aircraft ever built and the sound was unique. We did own part of a Cessna-172, which my father flew our family in, and he once smuggled me on one of his Texas Air National Guard Piper Cub "grasshopper" flights, and let me fly using the stick inserted in the back seat. If tankerenemy showed up at a VFW hall telling his lies, he would be lucky to ecape a thrashing by some nonagenarian's walking stick. I wonder how he's coping with MJM now??? I suspect that TankerEnemy ends up considering everyone a disinfo agent eventually. I think you'll find tankerenemy does not believe in chemtrails at all. Rosario Marciano and brother Antonio Marciano run tankerenemy.com as a business, with paid advertising and donation revenue. They are also youtube partners with google-adsense profit sharing which means they get paid money when people watch their videos. Running a chemtrail scare for fun and profit as outlined by Jay suggsts they are highly unlikely to edit or retract their claims when confronted with contradictory evidence. It's not in their financial interest to admit error . 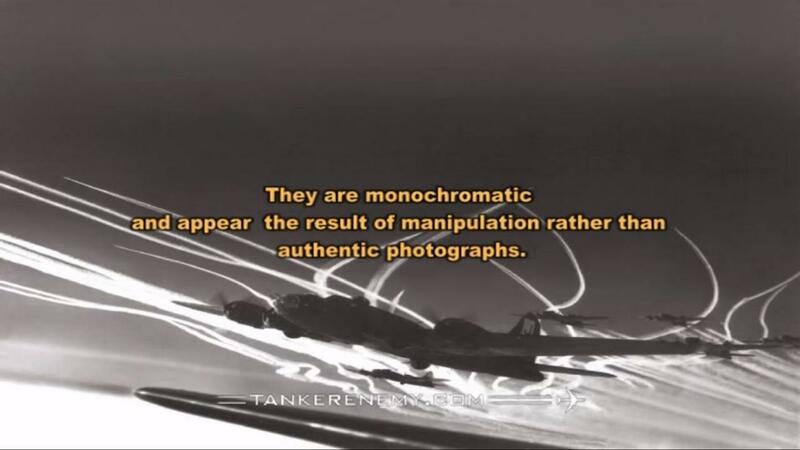 Tankerenemy relies on a number of individuals like youtube/user/skywitness to proselytise his videos such as the usaffekc10a's aerodynamic contrail footage in which Tankerenemy has labelled the flaptrack fairings as "nozzles". Despite being sent detailed proof that the features are flap-actuator/track fairings, both tanker and skywitness maintain denial of them being fairings and adhere to "nozzles". It's obvious from their occasionally witty discourse they could not seriously believe the fairings are actually nozzles so their insistence of an unsupportable nonsense indicates they are knowingly misrepresenting reality. I'd suggest they are deliberate hoaxers and cast out a wide net, hoping to snare the more gullible members of the public to their scheme. Yes, I agree, and I'm starting to collect links to the various "chemtrail" products and donation schemes that are the financial snake-oil motivation for the hoax. "what in the world are they SELLING?" Follow the money trail and a large part of motivational basis of the hoax is revealed. Here's a typical post from tankerenemy minion Skywitness who constantly directs people to view tankerenemy videos and even today is trying to direct people to watch tankerenemy videos from the "killer chemtrails" video by nuffrespect. Despite innumerable referrals to details about wing structure he/she maintains the "nozzle" dogma. I don't think it's credible that this individual could really believe in "nozzles" and reject the existence of flap track fairings, so it suggests such reality denial is financially motivated...... Could he seriously be that deluded...despite years of being linked to verifiable aviation documentation? Here's one spotted on ebay for you along with a certified list of evil chems in the trails. And here's another Greg. TBH I think I'll stick with gall stones rather than take the "cleanse"
There are also many products for sale, none of them cheap. This link was on a Chemtrail FB page, to help "cleanse the heavy metals being sprayed from your system"
I'm looking for a specific ref on her pages to chemtrails, just found a fair bit of quackery so far. I'm always impressed by the audacity of claims that things like cancer are a recent result of metals with the implication they are the result of human technologies and metal extraction and utilisation. Illness, including cancer, is metal disease. We should fall out of love with metals. Perhaps she should read some of the studies such as this: http://arxiv.org/abs/0704.1912 about the rates of bone cancer in dinosaurs. Although with the incas building big stone walls apparently to keep dinosaurs out as suggested by Mr Jeff Green Bunkerbuster, then perhaps that point is moot? "Dr." Hulda Clark, who looks hale and hearty, if not beautiful in the link above, was unable to save herself from the ravages of time and disease. She died several years ago of multiple myeloma (cancer). The link was posted on the FB page, Chemtrails Project, who are attempting to use science to prove chemtrails by testing rain samples. Unfortunately, they totally ignore the fact that dust blows about and is picked up by the rain on it's way to the sample jar. Planes can turn with out tilting, it is called a rudder turn. For slow turns planes just use the rudder which swings the tail of the plane around until it is pointing in the desired direction. Banking(tilting) is done by using the ailerons on the wings to make sharper turns. The bombers did not always make contrails but when the humidity level was high enough they filled the sky with contrails. Tankerenemy blocks everybody that does not agree with his paranoid delusions! When I see the WW2 contrails are hoax stuff I think of this..
Its the classic painting Battle Of Britain by Paul Nash, painted in 1941 from sketches made in the South of England at the height of the fighting. (full description here). Both the painting and the footage shows loads of persistent trails, some of which seamed to have hung around for quite a while. And finally my father and several other family members experienced the battle first hand, either as civilians, military or other roles (fire watchers etc) and all have said how the vapour trails hung in the sky for a 'long time' after the combat had ceased. Now is the painting and the footage faked?, are my relations all suffering from false memory syndrome? Are they in fact con (vapour) trails? This was the original letter referred to above (published April 26, 1943). It sounds like a circumzenithal arc? Makes you pine for the days when newspaper letters pages contained sober scientific discussion, doesn't it? 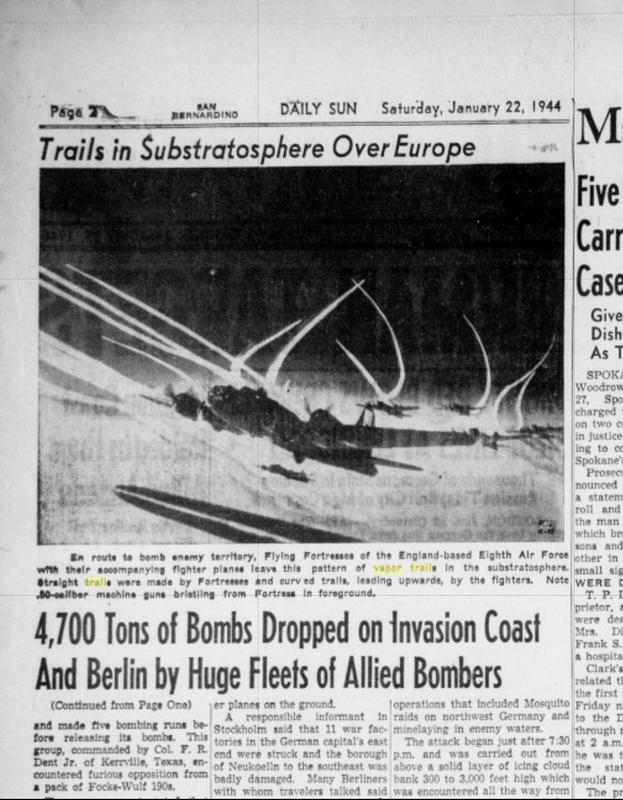 And one more, from Tuesday January 2, 1945, back when contrails were a welcome sight and not conspiracy fodder! The picture reproduction is pretty poor but the caption makes clear what it shows.